The head of the company that owns the Ringling Bros. and Barnum & Bailey Circus acknowledged in federal court Tuesday that all his elephant handlers strike the animals with metal-tipped prods, but he said it's necessary to keep the huge animals under control and doesn't harm them. Feld Entertainment Chairman/Chief Executive Officer Kenneth Feld said the circus probably couldn't have elephants without the prods - called bull hooks - and chains that are at the center of a trial in U.S. District Court. He said the prods and restraints are needed to protect the safety of his staff and the public. Animal rights groups are suing Feld Entertainment, saying the use of those instruments harms the company's 54 Asian elephants, an animal protected by the Endangered Species Act. The trial, being heard by U.S. District Judge Emmet Sullivan without a jury, already has been going on for a month and is expected to last a couple more weeks. The defense opened its case Tuesday by calling Feld as its first witness. The executive said he has no tolerance for mistreatment of circus animals, and employees are trained on proper policies and encouraged to report abuse. But under cross examination, he said the company has no policy to make sure he's personally aware of abuse investigations. He said he's seen handlers hit elephants under the chin, behind the ears or on the legs with a bull hook - which resembles a thick fireplace poker with a curved metal hook - describing it as a standard practice to "correct" or "guide" the animals. "I don't view what I've seen as abuse," he said. He said a handler was verbally reprimanded in 1994 for using a "hot shot," or electric prod, on an elephant, but not fired because experienced elephant handlers are hard to find and he didn't do it again. He also said the hot shot doesn't harm elephants, and is appropriately used to protect public safety or break up fights between the animals. The animal rights groups, including the Animal Welfare Institute, the American Society for the Prevention of Cruelty to Animals, the Fund for Animals and the Animal Protection Institute, are suing to stop Ringling Bros. from using elephants in their shows. Feld argued that the circus wouldn't be the same without elephants, with the majority of attendees saying they come to see the performing pachyderms. 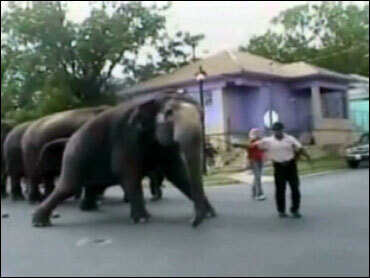 "Elephants are really the mainstay of Ringling Bros. and Barnum & Bailey," he testified. "They are probably the most important part and the most constant factor year in and year out." Feld said he considers his elephants part of the family, caring for them after retirement on a 200-acre conservation center in central Florida. He said his company spends more than $62,000 a year on each elephant, with 19 traveling with the show and the rest generating no revenue at the private conservative center. He said the company has the only sustainable herd of Asian elephants in the Western Hemisphere, with 22 elephants born since 1992 as part of its elephant breeding program. The latest birth was the first from artificial insemination - a male named Barack, born on the eve of President Barack Obama's inauguration. He argued that his elephants are more robust than those he saw in the wild during a family trip to South Africa last summer, where he saw them foraging for food in the bush, a "violent scene" of fighting males and a young elephant with sores over his head and trunk that had been abandoned. Feld Entertainment produces not only the circus, but Disney on Ice, Disney Live! stage shows and motor sports like monster truck shows and motorcycle races. The private company was started by Kenneth Feld's father and has remained a family business, with Kenneth Feld's two daughters working as executive vice presidents.